I’m not going to lie. November has way too many Thursdays for my taste. And I am not ashamed to take full advantage of an American holiday I am at best lukewarm on to get the day off. 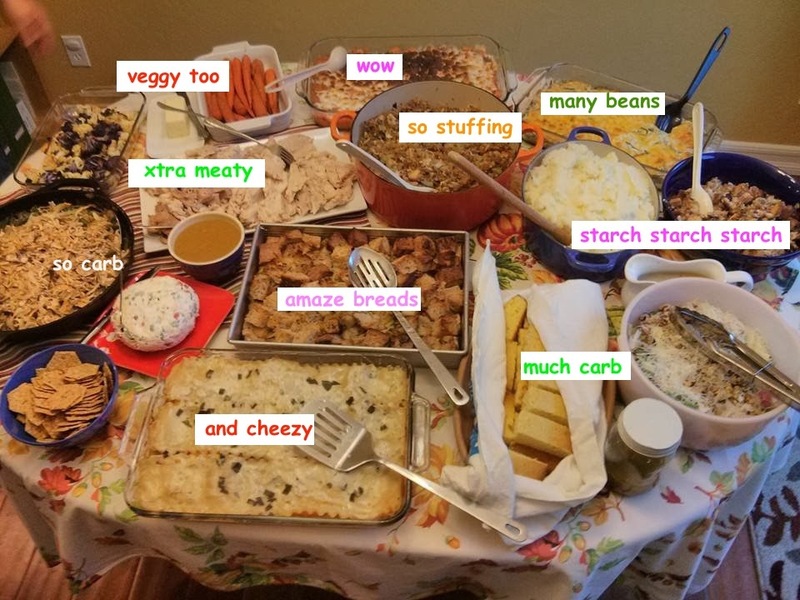 I will leave you with this amazing edit our friend Joe did of last year’s Thanksgiving dinner. Sadly, he didn’t capture my favorites, the turkey sugar cookies and the French silk pie, but it’s still pretty impressive! Also, don’t forget that Thanksgiving is merely the kickoff to a month of indulgent eating, so tomorrow, go find your fat pants and start getting ready for Christmas! Thank you so much! The blessing of good food and good company should never be overlooked! You’re welcome :) Even remembering all that food now makes me stomach ache! It is the day of the sacrifice of the turkey. Imagine if some other animal had been nominated. What about possum day or emu? How about the day of the elephant? Is not he turkey lucky or not? Your right and of course you do write. Happy Thanksgiving! It’s Lion’s football after we eat for our family. Go Lions!! I know woefully little about football, even though my grandfather coached (he did not pass on the passion to me or my brother!). Are the Lions…college…? And more importantly, did you get your Thanksgiving win?! The Lions are NFL and yes, we beat the Chicago Bears. It has been many, many years of the traditional Lion’s Thanksgiving lose, so the last few years with a decent team have been great! Thanksgiving isn’t one of my favorite holidays, but I sure do like all the awesome food! The spirit of the holiday is right (gratitude and all that) but I’m still kick starting my abilities to keep up with it. Love the snow, by the way! I may have to do that to my blog. So fun. Also, I’m working through Circ as we speak! It’s taking me longer than I thought because of some health issues, so so sorry! No rush on Circ! Our launch was last week, but trust me, we want to keep selling it even after those events are all done ;) Just work on feeling better soon!